So rich and full of flavors! This sweet pastry made of layers of phyllo dough filled with pistachios and sweetened with syrup is pure heaven. It requires a lot of effort but it is certainly worth it! Transfer water, sugar and rose buds in a saucepan and bring to a boil. Boil for 8 minutes until syrupy. Remove pan from heat and set aside. Preheat oven at 170C/fan and brush a rectangle baking tin (approximately 35×25 cm) with butter. Line the first sheet in the tin, butter and crinkle it to fit in the tin. Scatter ⅕ crushed pistachios over the pastry and continue the layering, buttering and scattering nuts for 4 more layers finishing with a phyllo sheet (crinkle and drizzle with butter as well). Score baklava in half lengthways and then in square pieces. Bake until nicely colored. Remove from the oven and set aside for 2 minutes. Drain syrup and discard rose buds. Drizzle baklava with the cold syrup using a tablespoon. Allow to cool completely. In the meantime, prepare the mousse: In a small saucepan heat water and sugar. In the bowl of a stand mixer fitted with a whisk attachment, whisk eggs until pale, thick and fluffy. Slowly add hot syrup. The mixture should fall in a ribbon rather than a stream. When mixture cools down fold in cream cheese and vanilla until well-combined. Set aside. In a sauce pan heat milk with finely crushed pistachios. When it comes to a boil remove pan from heat and stir in soaked gelatin until dissolved and well-combined. Beat double cream until thick and fluffy, like yogurt. Stir in egg mixture and gelatin mixture until well-combined. Refrigerate for at least 6 hours. 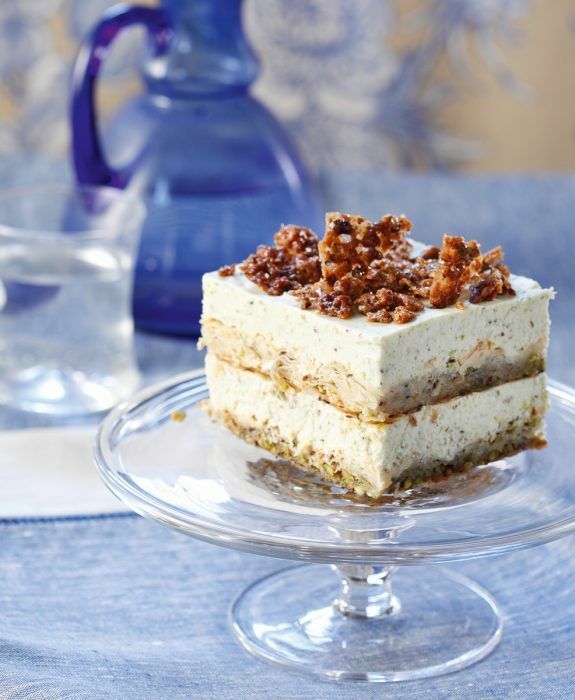 Assembling the cake: Place half baklava on a serving platter, spread half mousse, continue with the second half of the baklava and remaining mousse. Refrigerate until serving. Before serving decorate with pistachio florentines, crumbled.